Is it just me, or does winter seem to drag on forever? I am so ready for some sunshine and warmer temps! Lucky for me, I do love winter style. 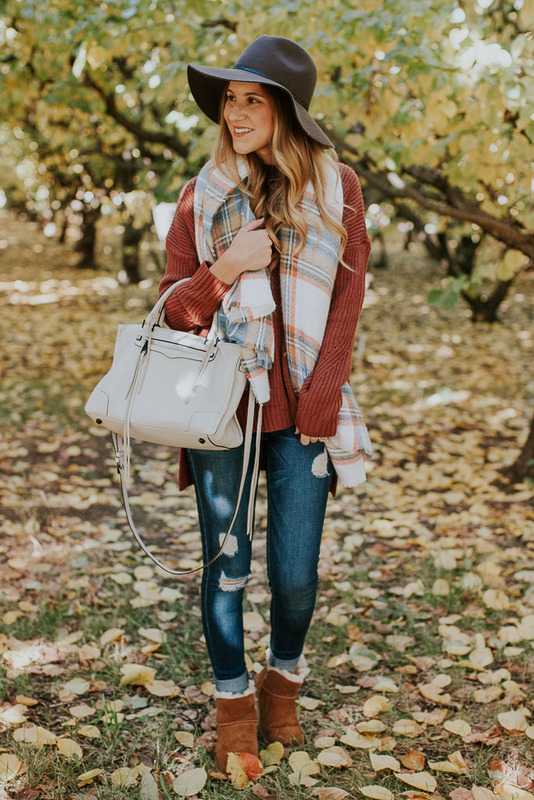 Cozy pieces that layer easily make the frigid temps more bearable! 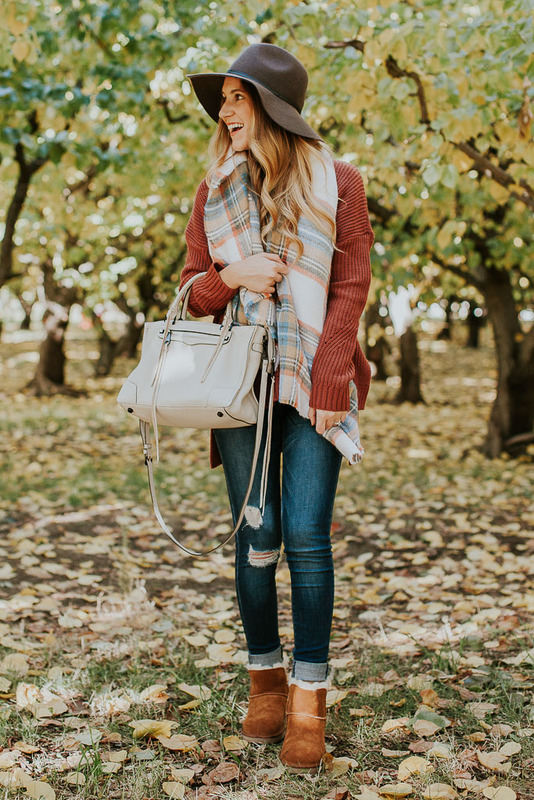 Today I am sharing my favorite cozy staples that will help get you through the rest of winter! 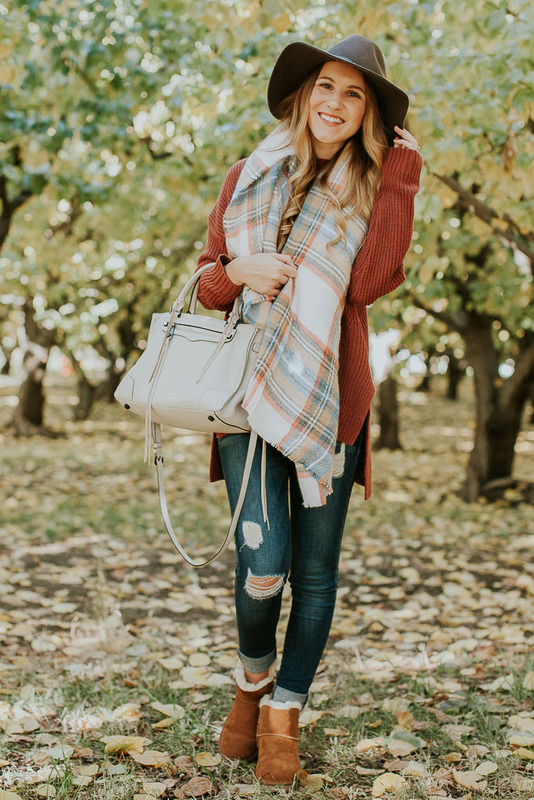 Oversized Fleece Pullover: I have been LIVING in this pullover, and it looks like many others have been too as this has been a top seller this winter! This is my favorite piece for throwing on before I head out the door. It’s also easy to layer up or down, depending on how cold it is. On the chilliest day, I often pair it with a long sleeve tee and top it off with a down vest or coat! 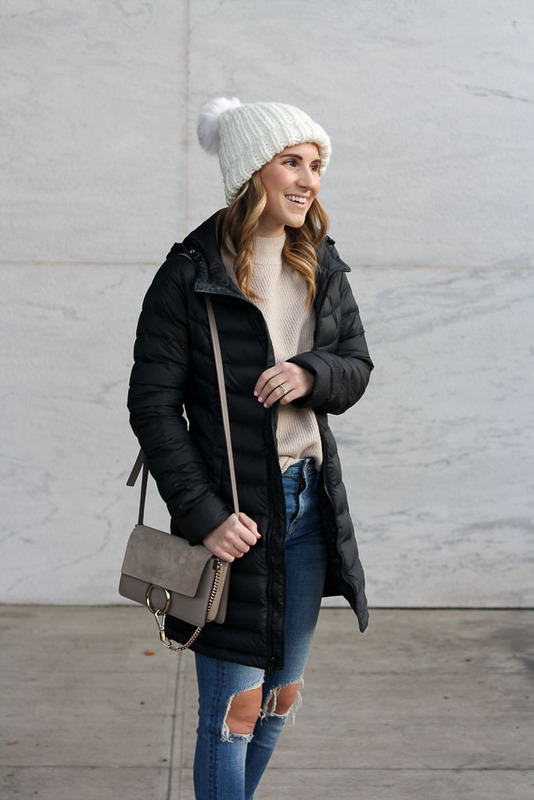 Down Parka: This is HANDS DOWN my most worn winter piece, as I rarely leave the house without it! It’s so warm, comes with a hood and is the perfect length! It’s a little pricey, but definitely worth every penny as I have gotten so much wear out of it and will wear it for the next few years! Beanies: A pom beanie is my favorite winter accessory. 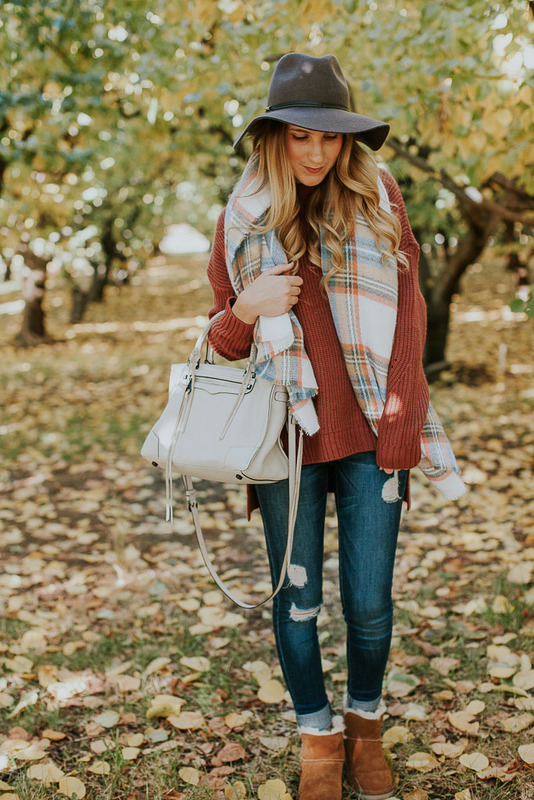 Topping an outfit off with a beanie is a great way to stay warm and tame crazy winter hair (anybody else deal with this??). 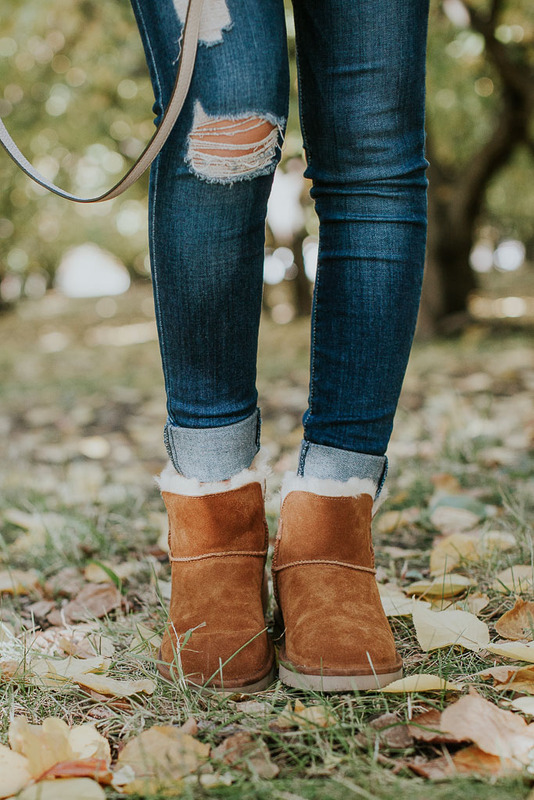 UGG Boots: A few weeks ago, I shared my love for UGGs and how I take them from a day of errands to a relaxed night out. UGGs are my number one winter staple. There is nothing I love more than slipping my feet into a cozy pair of UGGs on a chilly day! They are beyond comfortable and do a great job of keeping me warm! Nordstrom is always my first stop when checking for a new pair of UGG boots! They have the best options for women, men and kids and are always adding the newest selections from UGG to their new arrivals! My favorites are the Classic Mini, which will take me right into spring, and the Bailey Button, which can be rolled up or down! 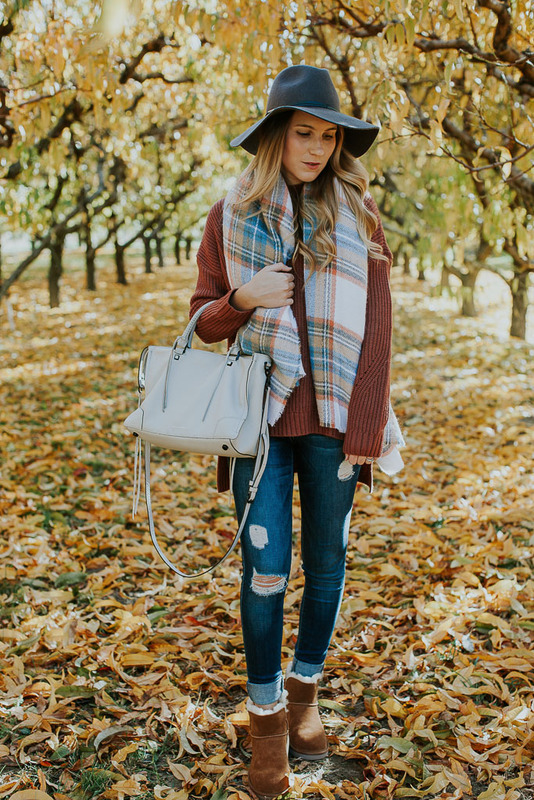 What winter staples are keeping you warm this season? Today’s post is in collaboration with Nordstrom, but all opinions are my own! Thank you for supporting the brands that Twenties Girl Style! 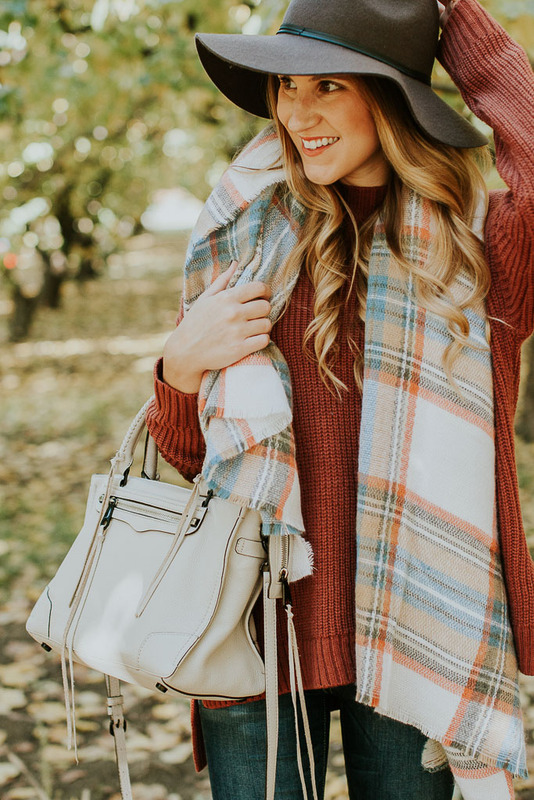 Just a few weeks ago, I shared my ultimate winter essentials. At the top of the list? UGG boots! I also mentioned that I will forever be an UGG girl. There is nothing compared to a cozy pair of UGG boots in the winter when it is freezing out! 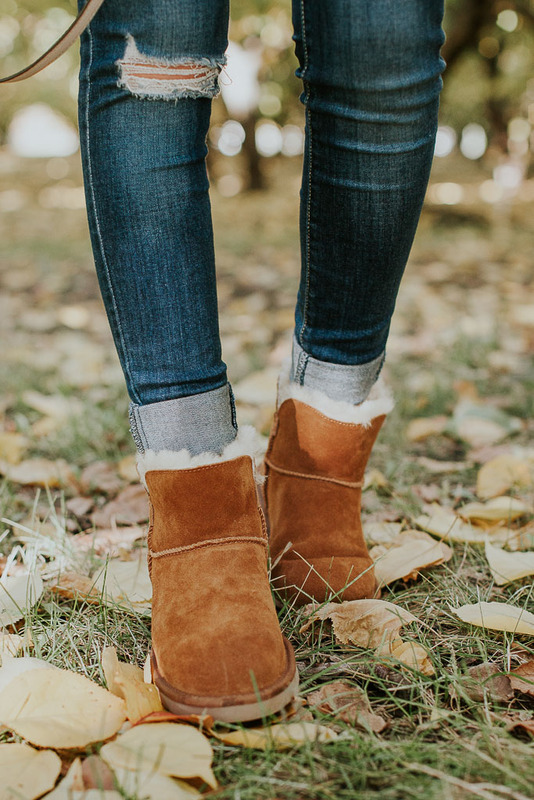 I rely on my UGG boots to keep my feet nice and toasty all day long, taking them from morning errands to dinner and a movie! Every year I invest in a new pair of UGG boots that I end up living in for the rest of winter. Nordstrom is always my go to when shopping for UGG boots because of their wide selection. 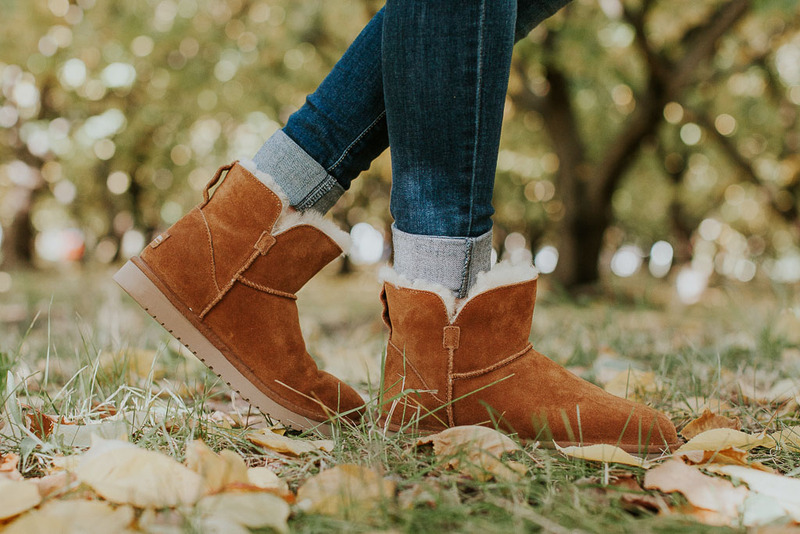 They have so many UGG styles and always carry the newest selection! I love my classic mini boots! They are easy to wear, durable and so comfortable. This mini version is easy to slip on and off and goes with everything! There are so many color options too, making me want to snag a second pair of these cozy booties! As I mentioned above, I wear my UGG boots with everything! Last weekend, E and I woke up early to run some errands. I slipped on my classic mini’s with my faux leather leggings (these are the BEST) to grab coffee and cross some things off of our to do list. Later in the evening, I paired them with my distressed denim and a cozy sweater for a quick bite to eat before heading to the movie theater. 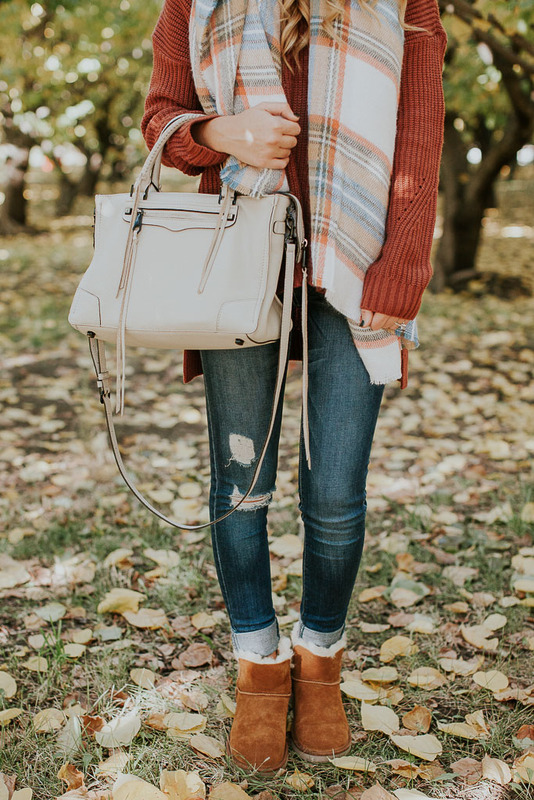 I LOVE the versatility off my UGG boots and the fact that I don’t have to sacrifice comfort and warmth when getting dressed! True life…I love UGG boots. I got my first pair of UGG boots when I was in high school and have owned multiple pairs since. They are my shoe of choice in the winter time as there is NOTHING better than having cozy feet when it’s cold outside! Last year I got my first pair of UGG slippers (these) and it stepped up my comfort level at home 100%. I’m telling you, if you don’t own a pair of UGG slippers, that needs to change! I love coming home from work and slipping on my slippers…it’s relaxation at it’s finest! This year, I decided to spoil my Mom with her own pair of UGG slippers for Christmas. I decided to go with the Alena slipper booties because I love that you can roll the cuff up or down depending on if your ankle is cold. When I got them, I tried them on and then didn’t want to take them off…oops. They are SO comfortable and warm! I ended up ordering a second pair and gifting the first pair to myself. Merry Christmas to me! They are JUST that good! Who doesn’t love gifting their favorite items to their loved ones though??? If you are still looking for a last minute Christmas gift, a pair of UGG’s would make a great gift for anyone in your life! Nordstrom has the best selection of UGG’s for men, women and kids. The best part? Nordstrom is offering free shipping guarantees arrival by Christmas if ordered by Noon ET on December 21st. So go ahead and get your shopping on and give the gift of cozy feet this Christmas! Shop my favorites at the end of this post! Today’s post is in collaboration with Nordstrom, but all opinions are my own! Can you believe there are less than 50 days until Christmas? It’s crazy to think about, but the holidays will be here before we know it! Now is the perfect time to get ahead of the holiday hustle and bustle and start your Christmas shopping early! I’ve already started making a list of goodies to pick up for my loved ones! At the top of the list? Cozy footwear! Growing up, cozy slippers or boots were always at the top of my wish list. I asked for a new pair every year, and would slip them on moments after opening them and practically live in them until a new pair took their place the following year. Is there anything better than fuzzy slippers or boots to beat the winter chill? My cozy footwear came early this year, in the form of the Classic Mini Boots from Koolaburra by UGG. They are the sister brand to UGG and at an extremely reasonable price point (under $100!). They are SO cozy and comfortable, that i’ve been wearing them snuggled up around the house and for running errands. I even wore them on a little family outing to the family orchard, and despite the chilly temps, my feet stayed nice and toasty! The entire Koolaburra line is all about being laid back and comfortable and who doesn’t love that? I know a few people in my life who would love these mini boots or even some of the slipper options (check out the Milo Slippers ($55) or the Margo Moccasin ($60) ). I am still in awe of the quality of these boots at their reasonable price points. Keep your loved ones cozy this winter with a gift from Koolaburra by UGG! This post was created in collaboration with Koolaburra by UGG. All thoughts and opinions are my own!